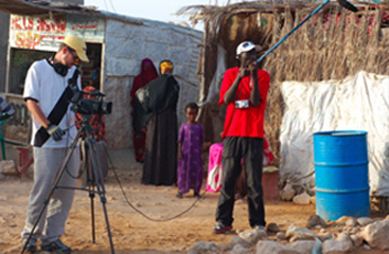 Filming a drama in Northern Somalia posed incredible challenges. 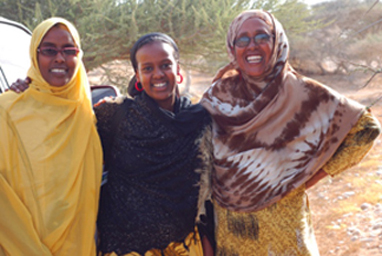 For a start a fictional film based on pastoral life had never been made in Somalia. Our aim was to film a drama in the Somali language so as to be accessible to Somalis. English subtitles make it accessible to people throughout the world. Following the collapse of the central government of Somalia in 1991, local administrations have governed with varying levels of effectiveness, very limited infrastructure and a lack of security. 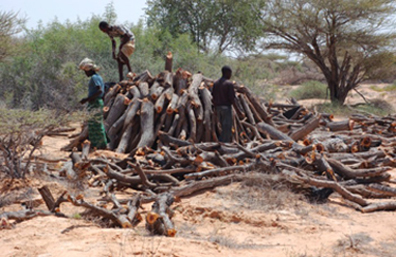 One of the outcomes of the lawlessness in most of Somalia is that the fragile Somali environment is being devastated by the unrestricted cutting of trees for cooking fuel in the form of charcoal. CHARCOAL TRAFFIC is a dramatic story which powerfully conveys the destructive effects of the charcoal trade to encourage Somalis to think about alternative cooking methods such as solar cooking. CHARCOAL TRAFFIC is based on actual events of pastoralists being murdered for confronting charcoal gangs destroying their trees and therefore their pasture lands and their way of life based on nomadic grazing of animals. The CHARCOAL TRAFFIC production team consisted of Fatima Jibrell, with James Lindsay, Fatima Ali Nuur, Deqa Abshir and Mariam Ali as assistants. The director Nathan Collett organized for arrangements to be ready beforehand so he could begin filming as soon as he arrived from his base in Nairobi, Kenya. 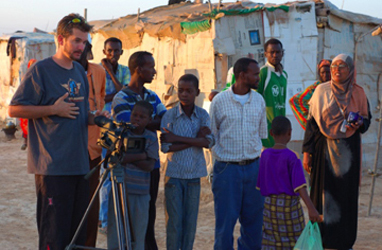 Nathan had only a few days in Somalia to film the entire story. The main location of the filming, Bosaso, a port town in northeast Somalia, a region known as Puntland, is remote and not easy to reach. Bosaso is located on almost the very tip of the Horn of Africa. Assistant Director, Goddy Ojiambo, could not get on the same flight with Nathan from Nairobi to Bosaso and arrived two days later. Nathan and Goddy had to bring all cameras, sound equipment and tapes with them as nothing is available in Bosaso. The first task was to find suitable actors. There are no theatre companies so finding people with acting experience was going to be difficult, and in fact proved to be impossible. Fatima contacted her friends and from within this circle she was able to gather together a small group of people who were willing to participate in the film. The next task was to find a suitable location for the filming. The film is set in a nomadic pastoral location. The countryside around Bosaso is desert, but after some searching Fatima located a nomadic family one and a half hours driving time away from Bosaso. With only three days to shoot the film, when Nathan arrived he said that such a remote location was impractical given the very tight shooting schedule. We had to improvise very quickly. Fatima borrowed some woven mats and constructed a nomadic hut on a dry riverbed on the outskirts of Bosaso. A family nearby agreed to lend us their flock of goats and the grandmother of the family agreed to play a role in the film. This was a far more practical option. The film probably could not have been made in the time and with the resources available at the more distant location. One of the main characters, Olaad, is a flashy charcoal dealer. Jewelry for men is not available in Bosaso so jewelry made for women was used with the necklace lengthened by bits of chord. Other props were easy to find. The script called for some of the actors to have guns. Genuine AK47s were borrowed without difficulty from local security guards. In one scene large bundles of cash are handed out. Genuine money was used in the filming. One hundred US dollars buys a stack of notes about 8 inches high in the local currency, the Somalia shilling. Clothes for the charcoal workers was bought from the second hand clothing market in Bosaso. We had to do the filming very early in the morning, usually getting up before dawn, and stop shooting before midday. We would resume again in the late afternoon. It was just too hot to film during the middle of the day. One scene was shot in a village teashop. The filming was done very early in the morning, but towards the end of the shooting a crowd began to gather to watch. Though friendly, they did not understand the need to keep quiet and to remain out of the scene. Everybody cooperated well. Fatima was kept busy interpreting instructions from English to Somali. No one in the cast and only two crew members understood English. The lack of acting experience of the entire cast meant that basic concepts were not understood. All the cast found it odd that the same scene had to be shot over and over again, and in exactly the same position.